Figure 1: Settings dialog - Instruments - Oscilloscopes - Toolbar - Oscilloscope. An instrument toolbar is created for each opened oscilloscope. It shows the current settings of the instrument and allows changing settings. 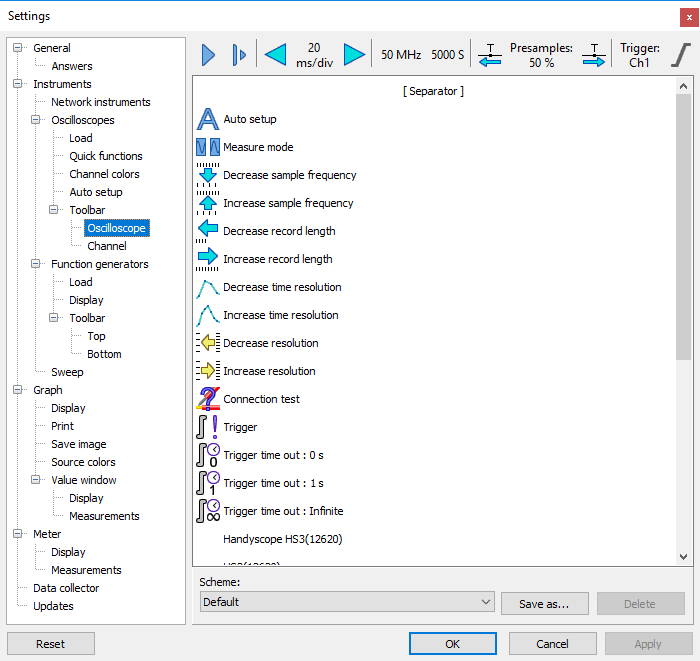 Advanced with the toolbar setting as used in older versions of the Multi Channel oscilloscope software, without time/div controls, but with many controls for controlling individual settings. Single which is equal to default, but optimized for use with just one instrument connected, without the instrument name and serial number to save space. To add items to the toolbar, simply drag them from the item list onto the toolbar located at the top of the dialog. The order of the items can be changed by dragging them to a different location. Separators are available to separate (groups of) toolbar items. To remove items from the toolbar, drag them from the toolbar to the item list. A description of the available items is found on the page about the instrument toolbar.